Context: Brain injury can cause coma and organized auditory stimulation (OAS) is thought to be associated with improvements in the level of consciousness. Setting and Design: This study was a randomized clinical trial and conducted from July 2012 to February 2013 in the Panje Azar Hospital of Gorgan, Iran. Materials and Methods: The patients from critical care units were enrolled and randomly allocated into two groups, each group 20 patients. The intervention group underwent OAS using a nurse's voice who tried to call the patients' attention to their place, time, identification, family, and profession. This stimulation was conducted thrice daily for 10 days, and patient consciousness was measured by the Glasgow Coma Scale (GCS). Statistical Analysis Used: We used mean and standard deviation, Chi square, t test, and repeated measures to analysis of data. Results: The level of consciousness increased in both intervention and control groups, but the increase in the intervention group was more than the control group (P < 0.01). 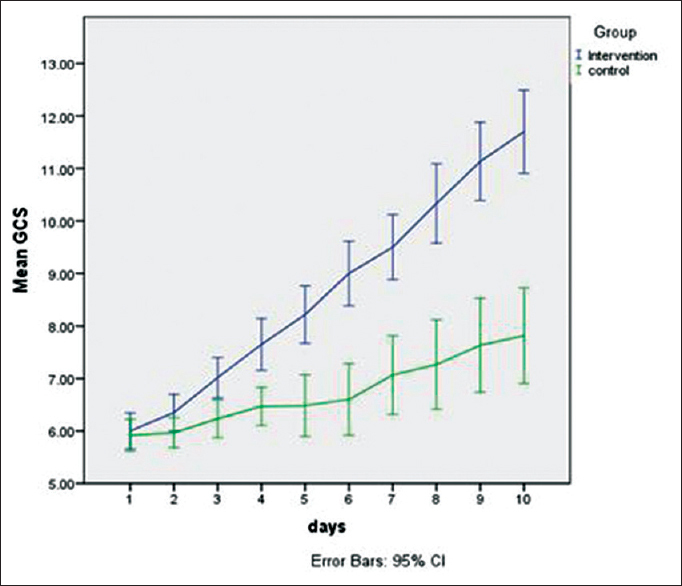 A significant difference in GCS between the intervention and control groups was observed on day 10 (P < 0.001). Repeated measures ANOVA showed significant differences within groups including time effect, interaction of time and intervention (P < 0.001). Conclusion: The level of consciousness of patients improved following an organized OAS by the nurses. Therefore, OAS likely will be a useful and applicable intervention for patients in Intensive Care Units. Traumatic brain injuries are the main cause of coma worldwide. Studies on unconscious patients have shown that they hear and recognize sounds,, and sensory stimulations in any species can stimulate the reticular activating system and increase activity in the brain cortex. Researchers have used different sounds for sensory stimulation., A systematic review indicated that there was no reliable evidence to support the effectiveness of programmed multisensory stimulation in patients in a coma or a vegetative state. However, A study among brain-injured patients indicated that sensory stimulation increased the level of the consciousness. Many studies have been carried out to evaluate the advantage of sensory stimulation on the level of consciousness in comatose patients. In some studies, music or a family member's voice was used as sensory stimuli in comatose patients., According to a study that used the voices of a female family member of the patient and an unfamiliar female staff member, the study indicated that differential activation was greater in response to a familiar voice in patients. Using the patient's name for self-referential stimuli and capturing attention into awareness showed that 37 (43%) of the 86 studied patients localized to auditory stimulation. Overall, more patients oriented the head or eyes to their name as compared to meaningless sound. Although unconscious patients may have suitable potential for reaction, lack of structured verbal communication with these patients may cause their condition to deteriorate and delay improvement in consciousness. Talking to comatose patients is an important part of nursing care. Sensory stimulation programs for coma patients to activate the level of consciousness, attention, and concentration  with a suitable intensity and appropriate manner may help the patients can regain their consciousness quickly. There is sufficient evidence to support the assumption that increased organized auditory stimulation (OAS) may affect the unconscious patient; however, studies suggest that intensive care nurses are not providing enough verbal communication as an AS. None of these studies have applied the nurse's voice as an auditory stimulus although nurses are qualified personnel who can help patients return to consciousness. Moreover, it is known that structured information that the unconscious patient receives from nurses results in stress reduction, causes them to retain their personality and confidence, and protects them against a reclusive lifestyle. 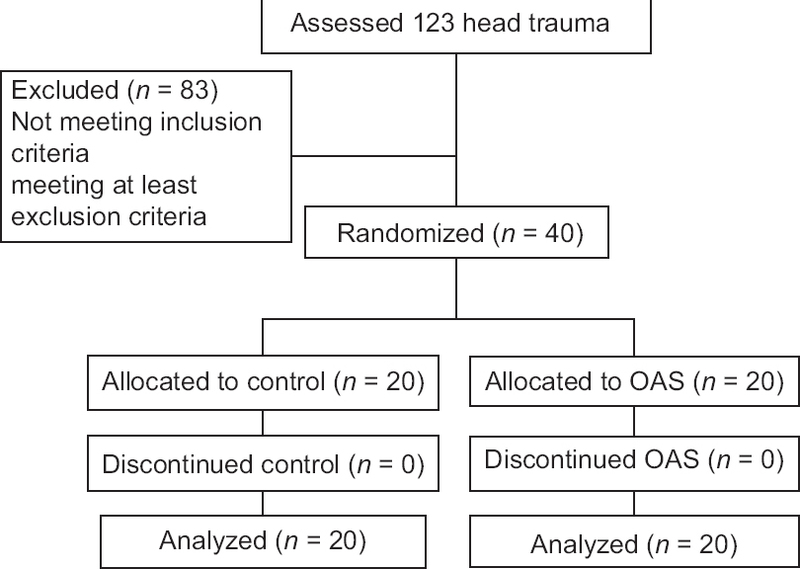 Therefore, this study aimed at evaluating the effectiveness of OAS with a nurse on the levels of consciousness in comatose patients with head injury. The study was a single-blind randomized clinical trial that conducted from July 2012 to February 2013 in the Panje-Azar Hospital of Gorgan, Iran. The target sample was head trauma patients hospitalized in the Intensive Care Units (ICU). To determine the sample size, we assumed a mean increase in Glasgow Coma Scale (GCS) scores of at least 4 units between baseline and postintervention during a period of 14 days based on a similar study. With regard to a critical α = 0.05 and a power of 90%, 28 patients (14 in each group) are needed to detect group differences. To account for dropouts and the increased variability of our sample, we increased the sample size to 40 patients. Patients admitted to the ICU were assessed according to the inclusion criteria. Patients with 15–60 years old entered the study after at least 3 days of hospitalization in the ICU with a GCS score of 8 or less and 24 h after stabilization of vital signs and intracranial pressure, determined by computed tomography (CT) findings. In the study, both male and female were included the samples but the numbers of the female head injuries were less and none of them had inclusion criteria. Patients with a history of previous disorders or reduction of auditory function, nontraumatic coma, history of cardiac arrest of longer than 4 min, history of seizures or convulsion, history of head injury, cardiac diseases or fat embolism, otorrhea or rhinorrhea, fractures of the skull base, bleeding or surgery in the temporal region, death before the 10th day, discharge from the ICU before the 10th day, and discontinuation of the study upon request by the patient's relative were excluded from the study. Patients meeting the inclusion criteria were randomly assigned to two groups, intervention or control, using a computer-generated permuted block randomization ensuring that 20 patients were included in each group. Two nurses conducted the study. The first nurse collected the initial data, helped to construct the content of the intervention, and his voice was used for OAS. He situated the headphone for each patient, and then, the recorded content of intervention was played for each patient separately, and the headphone was removed after the recorded message had been played. The second nurse measured the GCS score in initial of the study and then, 30 min after intervention, in the intervention group. The nurse measured GCS of control group in the same time without any intervention. He was an expert educated nurse who was excluded from the ICU during the auditory stimulation, so he was blinded to which patient is in intervention or control group. Throughout the study, the GCS score of the participants was measured by only one nurse. The information for use in the content of OAS was obtained from patient relatives and then organized and completed for each patient. The content of OAS was confirmed by researcher team and patients' relatives. The information content included the place (e.g., Mr. A. you are in the 5 Azar Hospital because you had an accident), time and date (e.g., today is Sunday. [weekdays] and [21 March…. ]), patient identification factors (e.g., you are 21 years old), details of family members, and some occupational information. The information was recorded in a male nurse's voice on a tape. Before starting the intervention, the patient's ears were examined by an ENT physician for defects and then played for approximately 10 min for each patient through. Before the intervention, the loudness of sound was checked for each patient. The intervention performed for 10 days thrice times daily–in the morning, afternoon, and before10 o'clock at night. The data collecting tool was a demographic form recording (age, marital status, education level, profession, and accident type) and a GCS form for measuring the patient's consciousness level. The GCS is most valuable, is frequently used, has the widest application, and is a practical scale for monitoring progress after head injury or intracranial surgery. The inter-rater reliability of the GCS, the level of agreement between physicians and nurses in the emergency department, was generally high (weighted kappa >0.75). The reliability of the GCS tool was 0.95; with Cronbach's alpha 0.96. The GCS represents visual, verbal, and motor responses scored between 3 and 15. The lowest rating was 3 and the highest was 15. A coma score of 13–15 is high consciousness, 9–12 moderate, and 8 or less indicates low consciousness in brain injuries. The eye response varies from no eye opening (score 1) to spontaneous opening of eyes (score 4). The verbal response varies from no verbal response (score 1) to orientated (score 5), and the motor response varies from no motor response (score 1) to obeying commands (score 6). The participants who have endotracheal intubation or tracheostomy, the verbal component scored 1. This study was approved by the Clinical Ethics Committee (approval no. 534/35/pg, 05/22/2012) and the Research Review Board (approval no. 9101220106) of Golestan University of Medical Science in Iran. The study was approved and registered in the Iranian Registry of Clinical Trials (IRCT code: IRCT2012071810325N1). Written informed consent was provided for all participants by their relatives, including a father, mother, or partner. Data were analyzed using SPSS 16. Data were analyzed through descriptive statistic such as mean and standard deviation and frequency. The mean GCS of intervention group was calculated before and after intervention for each day. In comparing of GCS score of two groups, we used mean score in each day which calculated of morning, evening, and night GCS score. A Shapiro–Wilk test was employed to distribution of the GCS scores normality. We used an independent t-test to compare the mean GCS scores of patients in both the groups at baseline (the 1st day before intervention) and on the 10th day and a paired t-test to detect mean GCS differences between patients for the baseline and the 10th day in each group. Repeated measures ANOVA between the two different groups was used to compare mean GCS scores within groups including time effect, interaction of time, and intervention. Mauchly's sphericity test was used to validate ANOVA, but it was not appropriate. Therefore, a Greenhouse–Geisser correction was used for analysis within groups. A Chi-square test was conducted to compare between demographic sample data in the intervention and control groups. P < 0.05 was considered to be statistically significant. Total participants were 40 comatose patients due to head trauma, all males, with a mean age of 28 ± 12.23 years (range 15–60). There were 20 patients in each group [Figure 1]. The mean age of the intervention and control groups was 28.20 ± 11.49 and 27.80 ± 13.22 years, respectively, and there were no significant differences between two groups. The majority (60%) of the participants were 15–25 years old. Some demographic data were described in [Table 1]. There were no significant differences between the demographic characteristics of the participants, including marital status, education level, and accident type. 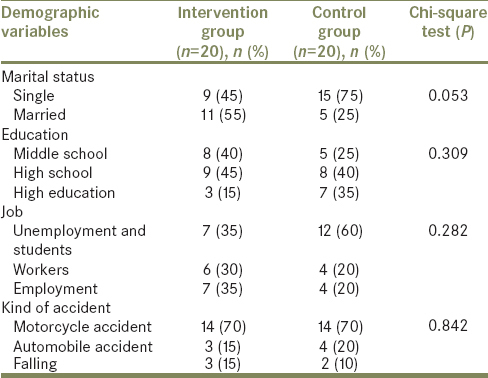 Head contusion was the most common injury in the intervention (8; 40%) and control (9; 45%) groups. An independent sample t-test indicated no significant differences in the average level of consciousness between the two groups on the before intervention in the 1st day (P = 0.81) [Table 2]. The paired t-test showed that the average GCS score on the 10th day increased (P = 0.001), compared with the 1st day, in the intervention and control groups [Table 2]. The results showed that the average GCS of patients in intervention and control groups was 8.50 ± 1.27 and 6.5 ± 1.27 on the 5th day, respectively. Moreover, a significant difference (P< 0.01) in mean GCS was found between intervention and control groups on every day, except for the 1st day [Figure 2]. Results of the repeated measurement test showed that the average GCS score in the intervention group was significantly higher than that in the control group from the second to the 10th day (P< 0.001), the 1st day was not significantly higher. Repeated measures ANOVA between the two groups showed significant differences within groups including time effect, interaction of time and intervention, and a GCS scores between the two groups (P< 0.001) [Table 3]. The study showed that OAS by a recorded nurse's voice through headphone led to increasing level of consciousness in comatose patients suffering from head injury. A study showed a significantly positive impact of OAS on the level of consciousness in coma patients. They used a family member's voice in participants of traumatic and nontraumatic coma. The conduct of the studies differed because the improvement of the patient's consciousness was reported differently. Furthermore, a similar study showed that there was a significant difference between daily mean score of consciousness during 14 days in experimental group; but our intervention was conducted during 10 days. Another study indicated that patients who received both direct and nondirect auditory stimulation exhibited significantly increased over baseline. The study did not show any adverse effect on coma patients. Some study reported that the sensory stimulation program did not have any adverse effect on patients' cerebral dynamic status. Our findings showed an increasing GCS score in the patients indicative of the powerful impact of the vocal stimuli. A study used different voices such as those of family members, voice of the patients, classical music, and bird song for auditory stimulation, but none of them had any significant effect on the level of the patient's consciousness. In the present study, instead of using some other sounds and voices that may not have any significant effect on the patients, the voice of a nurse was employed to for AS because nurses are believed to be adept in managing such patients and one of the nurses' task in caring for patients is to prevent sensory disorientation of the patient. The purpose of the patient's OAS content was to make them familiar with the place and time and to help identify their family members and some of their occupational aspects. Thus, concurrent OAS and orientation of the patients were done in this study, and the results seem to be positive and consistent with a study that used the patient's own name as compared to meaningless noise as a stimulation. The results showed more patients (40%) oriented the head or eyes to their own name compared to a meaningless loud sound. Similarly, another study found that a sensory stimulation program in traumatic brain-injured patients was significantly effective on the mean GCS score in the experimental group than in the control group. An increase in the GCS level in the intervention group was observed from the second day – a condition that has not been reported by other studies. A similar study found significant changes in the consciousness level of the patients after 2 weeks of sensory stimulation that intervention was done twice daily. However, in the present study, the intervention was done thrice on successive days. This seems to account for the significant difference in the early changes of consciousness level. Moreover, another study found that the first significant changes in GCS level occurred on the 4th day at the beginning of sensory stimulation. The present study showed that the average GCS score of patients in the intervention group was more than 8 from the 5th day, which indicates that the patients were out of the coma. However, in the control group, the GCS score average was <8 until the 10th day of the study. A sensory stimulation study was done once or twice daily for eight successive days. The result indicated that the average duration of coma in the case and control groups was 22 and 26.9 days, respectively. The small sample size and the shorter sensory stimulation time are the reason for the difference. The repeated measures test shows significant differences between time effect, interaction of time and intervention, and between the two groups. The results show that OAS is significantly effective in improving the patient's consciousness. In addition, the time effect results imply that there is a significant difference in increasing the patient's GCS scores from the first to 10th day in the control group. However, the range of GCS score alteration between the two groups of intervention and control was significant. That is, the intervention has been more effective than accounting only for the time effect. The AS has been variably effective in unconscious patients based on the kind of stimulation and the content of stimulation. There is no consensus on what kind of stimuli would produce more recovery in unconscious patients. Some studies have concurrently used a combination of stimuli,, whereas others have used a single stimulation by different types and content  and some with familiar and unfamiliar sound. The evidences have shown that sensory deprivation occurs during comatose condition. Therefore, provision of proper and safe sensory stimuli can establish synaptic links, provide sufficient stimuli for reticular activating system, and improve consciousness. Damage of the brain and unconsciousness and isolation reduces sensory stimuli and reticular activating system activation threshold. The majority of participants in this study were in the 15–25 year range. A similar study found that the most of comatose traumatic patients were between 25 and 44 years old. In this study, all of the patients meeting inclusion criteria were males and the majority were using a motorcycle – the most frequent cause of trauma-associated accident in this study. A study indicated that all of their participants were males and a motorcycle was the most common vehicle causing the accidents, which is consistent with this study. A study in Iran indicated that most of the victims were men (96.6%) with a male-to-female ratio of 28 and the most frequent age groups (41.3%) were 20–30 years. In Iran, young men prefer to use motorcycles. Therefore, this could probably be the reason that, in the study, the majority of head injuries were seen in participants in the age range of 15–25 years and all of the head injury victims were male. The limitations of the study include uncontrollable factors such as patient characteristics, inherent and demographic differences. Further, all of the patients were male; thus, we were unable to compare our hypothesis between genders. Despite having details of neurosurgical examination and CT scan images, we believe the patients probably differed with regard to the severity of inner trauma. The other limitation is that few participants had tracheal intubation and verbal component of GCS scaled one. The results of the present study showed that organized OAS by a recording of a nurse's voice in the intervention group improved the patients' condition and increased the level of consciousness of coma patients with head injuries compared with the control group. Therefore, nurses in the ICU can employ organized OAS in coma patients suffering from head injury to enhance the patients' level of consciousness. OAS is a useful and applicable intervention for patients admitted in the ICU. Further, nurses are the initial and most important personnel for using organized in comatose patients. This study was financed by Nursing Research Center of Golestan University of Medical Sciences. I would like to appreciate Nursing Research Center, the Vice President of Research and Technology of Golestan Medical Sciences University, Clinical Ethics Board, all the faculties, patients, their families, and all the nursing staff for their valuable cooperation in the course of the study. Bick AS, Leker RR, Ben-Hur T, Levin N. Implementing novel imaging methods for improved diagnosis of disorder of consciousness patients. J Neurol Sci 2013;334:130-8. Jesus L, Simões J, Voegeli D. Verbal communication with unconscious patients. Acta Paul Enferm 2013;26:506-13. Urbenjapho P, Jitpanya C, Khaoropthum S. Effects of the sensory stimulation program on recovery in unconscious patients with traumatic brain. J Neurosci Nurs 2009;41:E10-E16. Lee S, Ha S. Auditory stimulation effect to comatous patients. KAMJE 1997;21:1118-23. Puggina AC, Paes da Silva MJ, Schnakers C, Laureys S. Nursing care of patients with disorders of consciousness. J Neurosci Nurs 2012;44:260-70. Lombardi F, Taricco M, De Tanti A, Telaro E, Liberati A. Sensory stimulation of brain-injured individuals in coma or vegetative state: Results of a cochrane systematic review. Clin Rehabil 2002;16:464-72. Oh H, Seo W. Sensory stimulation programme to improve recovery in comatose patients. J Clin Nurs 2003;12:394-404. Abbasi M, Mohammadi E, Sheaykh Rezayi A. Effect of a regular family visiting program as an affective, auditory, and tactile stimulation on the consciousness level of comatose patients with a head injury. Jpn J Nurs Sci 2009;6:21-6. Cheng L, Gosseries O, Ying L, Hu X, Yu D, Gao H, et al. Assessment of localisation to auditory stimulation in post-comatose states: Use the patient's own name. BMC Neurol 2013;13:27. Ribeiro AS, Ramos A, Bermejo E, Casero M, Corrales JM, Grantham S, et al. Effects of different musical stimuli in vital signs and facial expressions in patients with cerebral damage: A pilot study. J Neurosci Nurs 2014;46:117-24. Simões F, Jesus L, Voegeli D. Verbal Communication with Unconscious Patients. Royal College of Nursing (RCN) International Nursing Research Conference; 2009. p. 108. Bassampour S, Zakerimoghadam M, Faghihzadeh S, Haghani H. The effect of organized auditory stimulations on the consciousness level of comatose patients. J Hayat 2007;13:5-14. Goudarzi F, Basampoor S, Zakeri-Moghadam M, Faghih-Zadeh S, Rezaie F, Mohamad-Zadeh F. Changes in level of consciousness during auditory stimulation by familiar voice in comatose patients. Iran J Nurs 2010;23:43-9. Park S and Davis A. Effectiveness of direct and non-direct audutory stimulation on coma arousal traumatic brain injury. Int J Nurs Pract2 016, 391-396. Huff JS, Stevens RD, Weingart SD, Smith WS. Emergency neurological life support: Approach to the patient with coma. Neurocrit Care 2012;17 Suppl 1:S54-9. Šstrand R, Romner B. Classification of head injury. Management of Severe Traumatic Brain Injury. Springer, Berlin, Heidelberg; 2012. p. 11-6. Davis AE, Gimenez A. Cognitive-behavioral recovery in comatose patients following auditory sensory stimulation. J Neurosci Nurs 2003;35:202-9, 214. Kavousipour S, Azimian M, Mirzaee N, Karimloo M, Kazemzadeh ES. Compare the effect of early and late onset sensory stimulation on the level of consciousness of the comatose patients. J Rehabil 2008;4:21-6. Sosnowski C, Ustik M. Early intervention: Coma stimulation in the Intensive Care Unit. J Neurosci Nurs 1994;26:336-41. Gosseries O, Vanhaudenhuyse A, Bruno MA, Demertzi A, Schnakers C, Boly M, et al. Disorders of Consciousness: Coma, Vegetative and Minimally Conscious States. States of Consciousness the Frontiers Collection; 2011. p. 29-54. Asadian L, Hadadi K, Montaza SH, Khademloo M, Mirzaii N. An epidemiological study of head injuries in patients attending Sari Imam Khomeini Hospital, 2013-2014. J Mazandaran Univ Med Sci 2015;24:207-16. Sargolzaei K, Shaghaee Fallah M, Aghebati N, Esmaily H, Farzadfard MT. Effect of a structured sensory stimulation program on the sensory function of patients with stroke-induced disorder of consciousness. Evid Based Care J 2017;7:7-16. Heydari Gorji MA, Araghian Mojarad F, Jafari H, Gholipour A, Yazdani Cherati J. Comparing the effects of familiar and unfamiliar voices as auditory sensory stimulation in level of consciousness among traumatic comatose patients in Intensive Care Unit. J Mazandaran Univ Med Sci 2013;22:208-14.